Ok, true story. Today we had a minor snow storm, about 7″, so of course the kids had off from school and the entire morning they were clamoring to get outside and play. Well, it was the first storm of the winter and needless to say one of their snow suits no longer fit (oops), and we needed to play some “musical chairs” with their winter apparel. This left my quite intelligent and athletic 7 year old son with a pair of snow pants that were brown with fuchsia and pink patterns on them (left over from my 10 year old daughter)… Let’s just say that he was less than thrilled about this, despite the fact that we’re the last house on a dead end street and there was little chance of anyone seeing him. Soooooooo, I had to bribe him to make it happen. He loved the garlic & parmesan skillet monkey bread I made the other day, so I upped the ante and said “what if I make you a CHOCOLATE pull apart bread, would you wear the pants then?” Well that sealed the deal, and here you now have my recipe for a crazy delicious, decadent, easy to make chocolate pull apart bread! You can thank my emotionally scarred son… hahaha. Combine the warm water, yeast and 1tsp of sugar and set in a warm place to allow the yeast to activate and bloom. The water should get creamy and a thick tan colored layer should form on top, approximately 10 minutes. In a mixing bowl combine the flour, 1/3c sugar, and salt. Add the water/yeast mixture and begin mixing on low speed, slowly adding the 4tbsp of melted butter. After 2 minutes increase the speed to medium and mix for an additional 1 minute. Turn off the mixer and allow the dough to rest for 5 minutes, this permits the gluten to relax and redistribute itself. Once rested mix the dough at medium for an additional 3 minutes. It should have pulled away from the sides and will be soft and slightly tacky to the touch. Grease a 9×5″ loaf pan. In a bowl combine the 1/2c each of granulated sugar and brown sugar, along with the cocoa powder. Melt 3tbsp of butter in a separate bowl. Using your hands, roll the dough into 1″ diameter balls, coat them in the melted butter and then in the sugar/cocoa powder mixture, then layer them in the bottom of the greased loaf pan. Cover the pan with plastic wrap and a towel and set in a warm, draft free place until the dough doubles in size, approximately 1 hour. Top the dough with the semi-sweet chocolate chips and drizzle it with the remaining 2tbsp of melted butter. Bake for 40-45 minutes. Allow to cool for at least 10 minutes before serving. 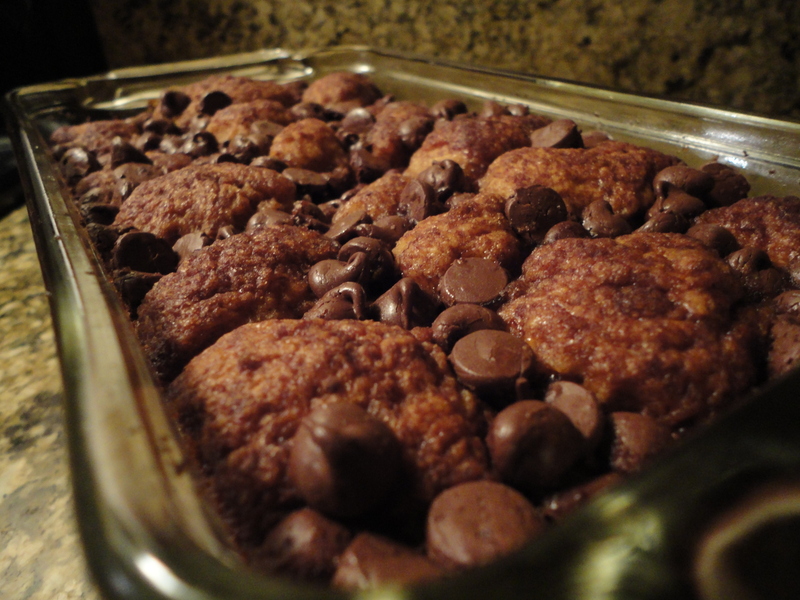 There you have it, chocolate pull apart bread… Your friends and family will love you, even if your scale doesn’t. Tags: baking, bread, chocolate, decadent, dessert, food, monkey bread, perfect pairings, perfect pairings at home, pull apart bread, sweets. Bookmark the permalink. Yes, yes it absolutely is!! !